If you live in Bombay and have a sweet tooth, then you have most probably treated yourself to a cupcake or macaroon from Pooja Dhingra’s Le15 Patisserie. She really needs no introduction- she is Bombay’s pastry princess, and she has brought the flavour of Paris to the city! The first time I ate a Le15 cupcake was when I was pregnant. One of my closest friends, Rachana, met me after work armed with the cutest little box. I’ve always loved desserts and cake; and during pregnancy my sweet cravings grew five-fold. I opened the box to find half a dozen gorgeous cupcakes- among them red velvet, chocolate, vanilla and vanilla with chocolate ganache frosting. I ate almost all of them on the cab ride back home- I left 2 for my husband because, well, that’s what wives do! Since then, I’ve been a fan of Le15. Till the time I went on maternity leave, I would regularly stop by their counter in Worli on my way back from work and pick up a box of cupcakes and some macaroons. (Sadly, that outlet has closed. But new ones have opened elsewhere!) So I ate quite a few cupcakes and macaroons while I was expecting; which probably explains why my son loves cake, too. 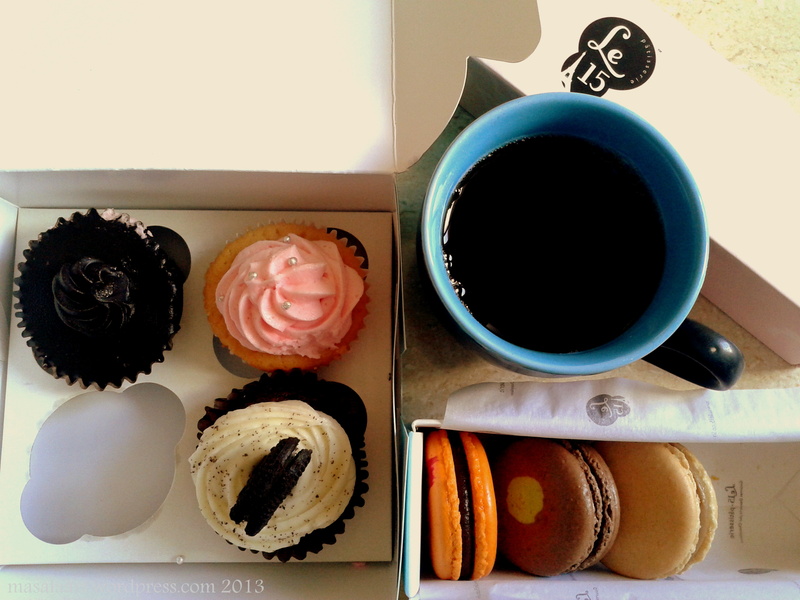 Now if only my waistline allowed a breakfast of black coffee, macaroons and cake each morning! Anyhow. Those of you who read this blog know that apart from food, I also love fashion. My dear friend Rachana, who introduced me to Le15 and other fabulous things like Aveda, Cheap Monday, and the power of a Pucci print, is a fashion and food journalist with a brand new fashion project called Fuffabulous. After writing for several publications in Bombay, Rachana pursued a degree in retail management and came back to Bombay and saw that there was a gap in the vintage and sustainable fashion sphere. Fuffabulous is dedicated to that. The concept is about sharing clothes and accessories which we no longer use; but hang on to for sentimental value. Then, those pieces are upcycled and styled into a whole new look! I was more than happy to be part of the project. Post pregnancy, I have invested in several pieces which I hoped to wear once I got back to my ideal weight- but I haven’t reached that point yet. So, Rach took a classic white pencil skirt and created a fun and playful look, mixing it up with polka dots! Clean toothpick = cake ready. Done! I’m all for eating cupcakes with a spoon. Passed the toddler taste test. I followed the recipe exactly; and what I got was a really gorgeous vanilla cupcake. These cupcakes were airy; but at the same time moist and dense enough to avoid crumbling as you bit in. Maybe it was the method suggested, (whisking in the flour and milk instead of folding it into the batter,) but it left me with a perfect cupcake. Like I told you, I’m addicted to Instagram and have been taking pictures of random things, so it would be awesome if you could join me. I’ve already been sharing with Heather, Ameena, Kiran and Dixya. To learn more about Rachana Nakra’s Fuffabulous project, visit her site, Fuffabulous, or if you are already on WordPress, just follow her blog! For regular updates and trends, follow Fuffabulous on Twitter or Facebook! i am heading over the recipe NOW. Oooh how you flatter me! Every time I am anywhere near their shop, I go in an buy half a dozen cupcakes. They are just.so.good! !